First Base Employment Limited (company number 03591062) (“First Base Employment Limited”) is committed to protecting the privacy of our candidates, clients and users of our website. We want to provide a safe and secure user experience. We will ensure that the information you submit to us via our website or through our office is only used for the purposes set out in this policy. 14. we may also seek your consent to collect, hold, use and disclose your personal information for any other purpose not listed above. 15. our website may also use a website recording service which can record mouse clicks, mouse movements, page scrolling and any text keyed into website forms. Data collected by this service is used to improve our website usability. The information collected is stored and is used for aggregated and statistical reporting, and is not shared with anybody else. We will keep paper copies of your application form and accompanying cv (if relevant) along with any supporting documentation such as driving licences and ID for a period of 2 years when they will then be deposed of confidentially unless there is a need to keep records longer for legal purposes. Electronic records are maintained for a period of 5 years unless there is a need to keep records longer for legal purposes. You have the right to be forgotten, to edit your preferences, to opt in and out of marketing, to receive job alerts, etc any any point. Please speak to your contact at First Base Employment in order to manage your data. To subscribe to job alerts emails, you will be required to provide your e-mail address, which will be used for the purpose of keeping you informed, by e-mail, of the latest jobs in your nominated industry and/or will provide you with industry news. Should you decide that you no longer wish to receive this information, please advise us phone email, text, phone, or in person. Job alerts can also be received via RSS feeds without having to provide your email address. Job alerts emails are sent by First Base Employment Limited. We give you the option of submitting your CV via our website or by providing your CV to one of our consultants. You can do this either to apply for a specific advertised job or for consideration by our recruitment consultants for positions as they come up. Your CV will be stored in the First Base Employment database, and will be accessible by First Base Employment recruitment consultants. We gather information and statistics collectively about all visitors to our website and all of the First Base Employment company websites, for example, which area users access most frequently and which services users access the most. We only use such data in the aggregate form. This information helps us determine what is most beneficial for our users and how we can continually improve our online services to create a better overall experience for our users. We may also undertake marketing profiling to help us identify services or jobs which may be of interest to you. If you would like to make a request for information, please contact safedata@first-base.co.uk. You also have the right to ask First Base Employment to stop using your information. However, if this involves a request for deletion of your file, please be aware that we may not be required or able to do so, particularly where your file also holds information about our clients or financial information that we need to keep for periods of up to six years, i.e. that relate to tax matters. Where we are unable to comply with your request we will provide reasons for failing to do so. 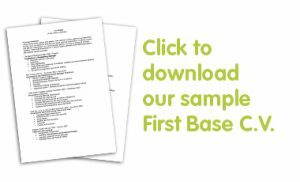 If, at any time, you have questions or concerns about First Base Employment’s online privacy commitment, please feel free to e-mail us at safedata@first-base.co.uk or call the office to speak to one of our representatives on 01453 755330. First Base Employment is an equal opportunities employer and a company committed to diversity. This means that all job applicants and members of staff will receive equal treatment and that we will not discriminate on grounds of gender, marital status, race, ethnic origin, colour, nationality, national origin, disability, sexual orientation, religion or age.